Extended version with the Chest Rig Base instead of the Front panel, providing two additional MOLLE PALS columns. 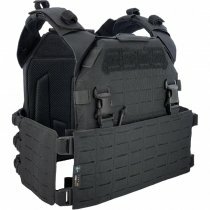 The Pitchfork MPC Modular Plate Carrier has been designed to address the changing needs of law enforcement and military end users. The high-grade modularity allows a wide range of applications, adaptable to the respective requirements, without the need to procure and maintain a variety of different systems. The Plate Carrier is foldable and can be transported very space-saving, which is a great advantage especially in mobile applications. Due to its highly modular design, the MPC can be upgraded to a heavy duty vest with separately available components. The Cummerbund can be replaced by a completely closed design, which accommodates soft and hard ballistic inserts. It is also expandable by deltoid- , neck- and a groin protector. Contact us if you are interested for a personal consultation.